The U.S. Air Force's experimental X-51A Waverider vehicle flew under its own power for four minutes on May 1, 2013, reaching a top speed of Mach 5.1. 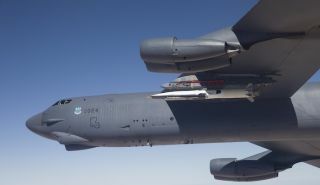 The U.S. military launched an experimental hypersonic aircraft on its swan song test flight Wednesday (May 1), accelerating the craft to more than five times the speed of sound in the longest-ever mission for a vehicle of its kind. The Air Force's X-51A Waverider reached a top speed of Mach 5.1 during the test flight, traveling more than 230 nautical miles in just over six minutes before crashing into the Pacific Ocean off the California coast as planned, Air Force officials announced today (May 3). "It was a full mission success," Charlie Brink, X-51A program manager for the Air Force Research Laboratory Aerospace Systems Directorate, said in a statement. The X-51A took off Wednesday morning from Edwards Air Force Base in California under the wing of a B-52H Stratofortress. The Waverider was released at an altitude of approximately 50,000 feet (15,000 meters) and used a solid rocket booster to accelerate to Mach 4.8 in just 26 seconds. The Waverider then separated from the rocket and sped up to Mach 5.1 at an altitutde of 60,000 feet (18,300 m), powered by its air-breathing supersonic combustion ramjet (scramjet) engine, officials said. The X-51A burned up the scramjet's four-minute fuel supply and was destroyed as expected upon impacting the Pacific Ocean. All told, the vehicle returned 370 seconds of flight data. While there is no plan to build any more X-51A vehicles, officials said the $300 million technology demonstration program, which began in 2004, leaves a valuable legacy. "I believe all we have learned from the X-51A Waverider will serve as the bedrock for future hypersonics research and ultimately the practical application of hypersonic flight," Brink said. While most other hypersonic vehicles use hydrogen propellant, the X-51A's scramjet is powered by hydrocarbon fuel, which Air Force officials say is more logistically feasible and could allow the technology to be applied on a broader scale. The first X-51A test flight occurred in May 2010. It was hailed as a success, as the vehicle flew for more than three minutes and reached Mach 4.88. The next two flights, in June 2011 and August 2012, both failed. The U.S. military has been studying hypersonic flight in order to develop new weapons capable of striking targets anywhere on Earth within an hour. In addition to the Air Force's work with the X-51A, the Defense Advanced Research Projects Agency (DARPA) has launched two test flights of its HTV hypersonic bomber prototype, which reached Mach 20 in an August 2011 test flight before losing control. While that 2011 HTV mission lasted nine minutes, the vehicle only demonstrated controlled flight for three minutes during the test. The HTV was also a glider vehicle, and not an air-breathing scramjet.